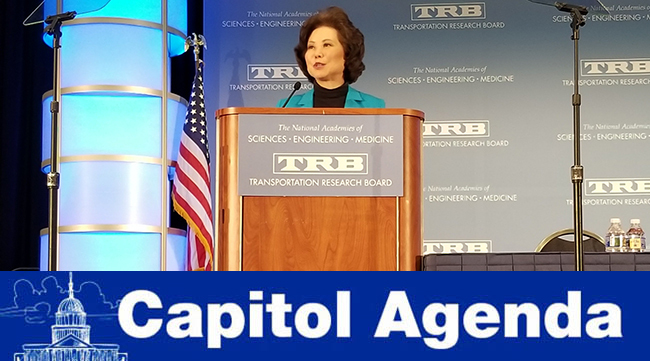 Consumer trust will be a key factor for realizing the potential safety benefits of autonomous vehicles, Transportation Secretary Elaine Chao told attendees at the annual meeting of the Transportation Research Board on Jan. 14. Noting that more than 37,000 highway fatalities were recorded in 2017, Chao encouraged carmakers and other firms advancing self-driving technology to enhance their communication to ensure people understand modern vehicles’ capabilities. In October, Chao unveiled AV 3.0, U.S. DOT’s update of guidelines for autonomous vehicles. Input from stakeholders was included in the policy update’s development, Chao explained. Nine manufacturers opted to unveil voluntary safety self-assessments, which are available to the public. “The department applauds this transparency and encourages others to do the same,” the secretary added. Over in Congress, policymakers are expected to proceed with legislation meant to facilitate testing, as well as product development for such vehicles. Safety concerns helped to stall autonomous vehicles legislation in the previous Congress. In the meantime, the industry is rapidly proceeding with commercial and passenger models. Recently, at The International Consumer Electronics Show in Las Vegas, Daimler demonstrated one of its latest gadgets. It would appear, the robots are already here. Jan. 22, 11 a.m.: Advocates for Highway and Auto Safety hosts a news conference about the “2019 Roadmap of State Highway Safety Laws,” which ranks the states and Washington, D.C., on passage of 16 essential traffic safety laws. Participants include Janette Fennell, founder and president of KidsAndCars.org; Matt Gannon, head of federal affairs at the Farmers Insurance Group; Elda Ramirez, director of the University of Texas Emergency/Trauma Nurse Practitioner Program; Helen Witty, national president of Mothers Against Drunk Driving; and Cathy Chase, president of Advocates for Highway and Auto Safety. Jan. 23-25, 8:30 a.m.: The U.S. Conference of Mayors hosts its 87th Winter Meeting. Jan. 24, 11 a.m.: National Journal magazine hosts a webinar titled, “New Year, New Congress.” Editor Ben Pershing is scheduled to guide the conversation. Jan. 25, 3 p.m.: The Woodrow Wilson Center hosts a panel discussion about energy and the environment. Participants include Juliet Eilperin, senior national affairs correspondent at the Washington Post; Ellen Gilmer, reporter at E&E News; Pradnya Joshi, trade and agriculture editor at Politico; Christina Larson, global science and environment correspondent at the Associated Press; Eric Lipton, investigative reporter at the New York Times; Jeff Burnside, member of the Society of Environmental Journalists board of directors; and Emily Holden, environment reporter at The Guardian. HOT SEAT: Trump’s nominee to oversee the country’s environmental policies was pressed by Democrats over climate change. EMPIRE STATE: The New York State Department of Transportation announced that state inspectors will begin enforcing federal electronic logging device rules, ending a year-plus stretch during which a lawsuit kept the state law enforcement in limbo and left federal inspectors as the sole enforcers of the rule in the state. FMCSA: Federal trucking regulators expressed concern over increasing numbers of large-truck-involved fatal crashes in work zones and a continuing increase in the number of fatalities of large-truck occupants. Hundreds of mayors attending this week’s annual conference plan to call on Congress and the White House to craft long-term infrastructure policy this year, insiders tell us. We have a record number of women serving on a Senate committee, so I’m very proud that we have so many women. Hopefully, we’ll put our imprint on what we think the economy of the future looks like and what we need to do. — Sen. Maria Cantwell, Commerce Committee ranking member, on Jan. 16. Meet the new chairman of the Commerce Committee. With the shutdown ongoing, the new chairman of House T&I updates us on the Coast Guard.